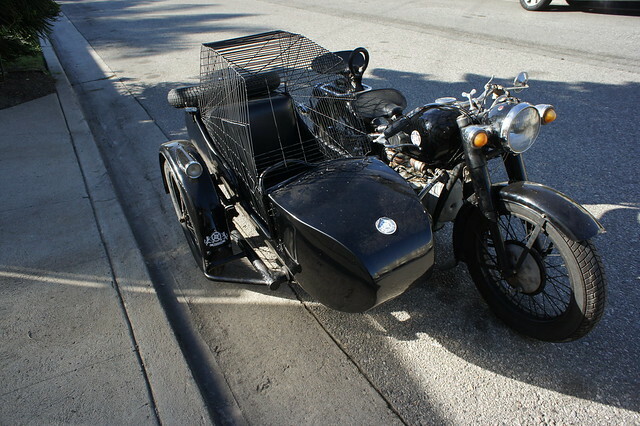 Motorcycle Sidecar Dog Cage Completed! Finally had a chance to finish up and paint the sidecar cage. I'm very pleased with how it came out. I learned a lot of lessons which would lead me to do some things differently were I to do it again, but I doubt I would do it again because most of those lessons related to my cutting lots of corners knowing my attention span was limited and I just needed to push through and get it done as quickly as possible. And fortunately nobody else will know what I know about the corners I cut, so it hardly matters. I think the entire project took me about 35 hours, from idea to completion. The dogs have yet to ride in the completed version. On what was to be the first test ride, with dogs all loaded up and in their goggles, the spark advance cable snapped as I tried to start the engine. I replaced that part within a day or two only to have the December rains descend on Southern California. Hopefully by Wednesday they clouds will part and the dogs and I can show it off. And here's the link to all the pictures of it.